In February 1946, George Orwell wrote an essay, The Moon Under Water, in which he outlined his ideal London pub. Sadly, the eponymous pub was completely fictitious (contrary to the belief of the JD Wetherspoon chain) and the essay concluded, somewhat bleakly, with the fact that the perfect pub doesn’t really exist. At the time, The Jugged Hare wasn’t yet operating. On the site of an old brewery, just across the road from the Barbican Centre, The Jugged Hare is part of ETM – also responsible for The Botanist, Aviary and Greenwood. Unlike The Moon Under Water, The Jugged Hare does serve dinner, and what a dinner it is. Towards the back of the pub, The Jugged Hare’s dining room has a polished rusticity, like a loveable country pub. Hanging from the walls, various members of taxidermy adorn the space, exhibiting the restaurant’s prominent game theme. Though a vegetarian menu is available, this is very much a restaurant for meat-eaters. Elsewhere, the room is comfortable and sympathetically lit, complete with warm, effusive servers. Currently in season, the restaurant’s eponymous dish dates back to the 18th century, famously described in Hannah Glasse’s influential cookbook The Art of Cookery. Out of favour 300 years on, jugged hare makes use of whole wild hare, traditionally marinated and cooked in red wine and juniper, ensnared within a tall jug and cooked in water. A more macabre phase, the cooking of the hare is finished with its own blood. But more on that later. Elsewhere on the menu, daily-changing specials are typically seasonal, using game sourced from some of the UK’s most respected suppliers. 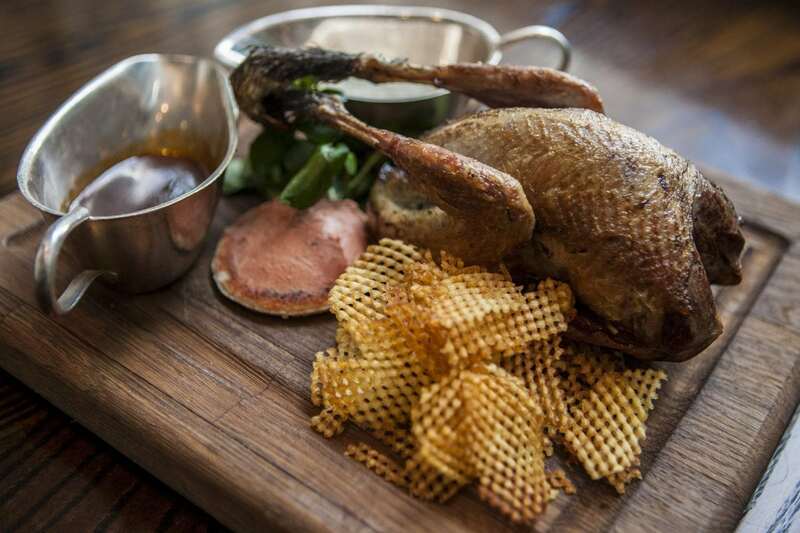 Launched during the summer, The Jugged Hare has collaborated with The Craft Distilling Business to create an exclusive roast grouse and heather gin – delectably savoury and best enjoyed neat, as an aperitif or with the grouse main. A further introduction to the game feast, game offal bomb encompasses orts of iron-rich offal from game birds and wild boar, cased within a thin puff pastry shell and topped with a theatrically-lit fuse of fresh rosemary. The ‘bomb’ itself is delightful, though it’s the convoying moat of sauce, rich with red wine and juniper, so entrancing it demands to be scooped with a spoon and devoured with gusto. Wild boar and wood pigeon terrine is coarse and rife with pleasant flavour, though it would benefit from being removed from the fridge at least 15 minutes before serving. One of the specials available this evening, a whole mallard duck is served with game chips and cabbage. Plentiful for at least two, the whole duck is hefty, yet young and with flavour less unsettling than later in the season. Perfectly cooked, the enormous breasts are pink with crisp skin, the confit legs are lavishly opulent. As for the famous jugged hare, the slow-braised hare meat is literally served within a large enamel jug, melting in the mouth with profound richness, not for the light hearted, from an abundance of blood used in the sauce. Also plentiful and nigh on impossible to eat in one serving, the jugged hare is simply outstanding, mixed with accompanying mashed potatoes to add bulk and tame some of that inane decadence. Following the sizeable mains, desserts are completely unnecessary, yet tempting. A parade of classics includes apple and stem ginger crumble; sticky toffee pudding; and warm rice pudding that’s slightly al dente, creamy and served with wedges of fig and heather honey to deliver spades of flavour. The main draw at The Jugged Hare, though, is the game, as expected – all treated with utmost respect and cooked tremendously well. Highly recommended. 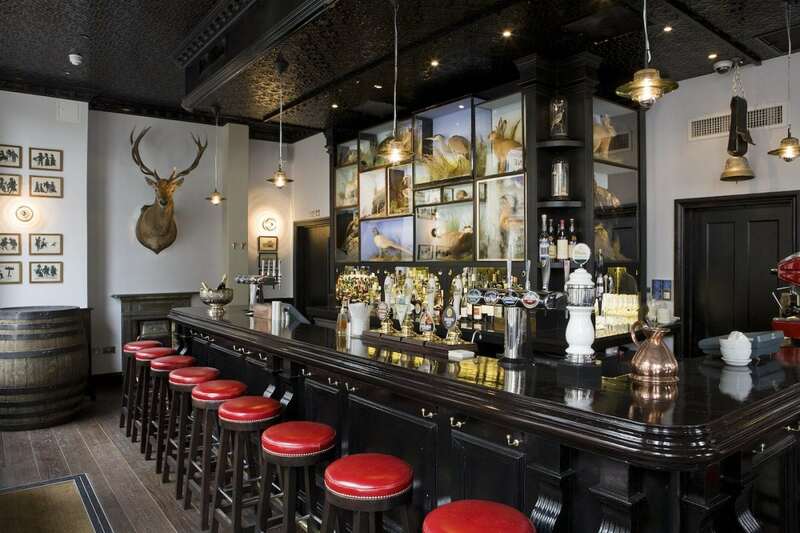 The Jugged Hare can be found at 49 Chiswell Street, London EC1Y 4SA. What Would A Purely British Pub Look Like?